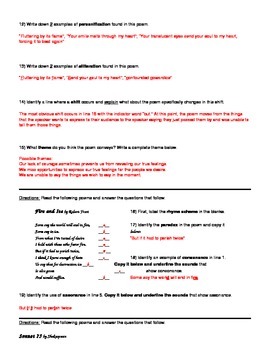 This poetry workbook includes 32 questions/exercises that assess students on the following poetic elements: tone, diction, theme, assonance & consonance, figurative language, audience, paradox, rhyme scheme, shifts, enjambment, etc. 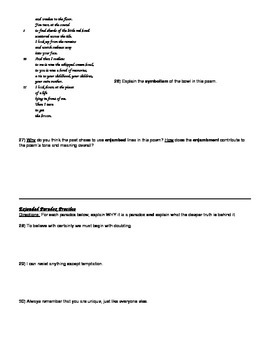 The workbook includes five different poems to analyze these elements as well as a paradox analysis section at the end. 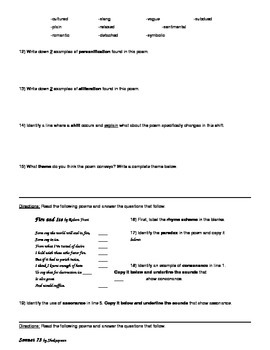 A complete answer key is included at the end of the document.